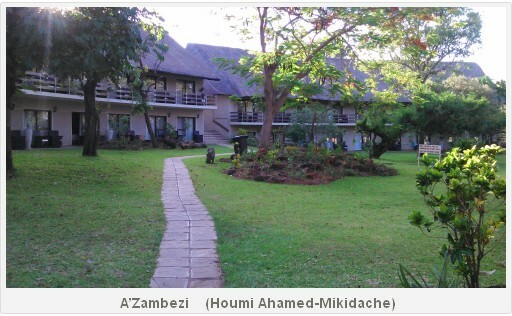 Charles Mdefi, born in Masvingo, one of the 8 provinces of Zimbabwe, is working at the 4 star A’Zambezi River Lodge, for two years as a receptionnist. He is experiencing everyday life with the animals in this hotel, located in the river about 5 kms out of the town and 6 kms from the Victoria Falls entrance gate. In this hotel, you can meet Impalas, Warthogs and Hippos. Sebastien is one of them and he is reachable. “If you do have a cellphone number, so if you are serious, if you want to see them, I can ask, Sebastien can you please come over that side,” said Charles Mdefi. But Hippos are not available during the day. “Normally the Hippos stay in the river for quite a long time, because, during the day, they normally stay in the water. Only during the night, they come out from the water. Because of their skins that are very sensitive to the sun,” explained Mdefi. The town of the Victoria Falls, one of the largest waterfall in the world, is facing a long heat and drought period with no rainfall. 36 Degres celcius everyday. For many years the Falls have seen a significant reduction in the water level. Climate Change is affecting the weather and the people who are living in this town are suffering from it but cannot explain it. It is in this context that the fifth conference on climate change (CCDA-V) was organised recently by the African Climate Policy Centre of the United Nations Economic Commission For Africa (UNECA), and the government of Zimbabwe in Victoria Falls. In his opening speech, the Vice President of Zimbabwe, Mr Emmerson D. Mnangagwa mentioned the power challenges faced by his country and Zambia related to the lack of water. “Zimbabwe and our Zambia counterparts are grappling with power challenges which have been triggered by reduced rainfall and run off by our major Dam Kariba,” informed the Vice-President of Zimbabwe. For Precious, another receptionnist from A’Zambezi Hotel, and a student in environmental urban safety management, it is important to preserve the falls for the future generation. According to a recent report from the World Meteorology Organization (WMO), Carbon Dioxide is the single most important anthropogenic greenhouse gas in the atmosphere. The average increase in atmospheric CO2 during the last decade corresponds to ~44% of the CO2 emitted by human activity and there is a portion of CO2 emitted by fossil fuel. The World Bank warned in a new report that more than 100 million additional people could be pushed into poverty by crop failures, floods, hunger, and other shocks caused by climate change. The upcoming conference of the 2015 United Nations Framework Convention on Climate Change (COP 21) will start in Paris on November 30 to December 11th. According to a recent press conference in Victoria Falls with members of the African Union, the AfDB and UNECA, African head of states will speak with one voice in Paris to obtain a legally binding, fair and inclusive agreement.